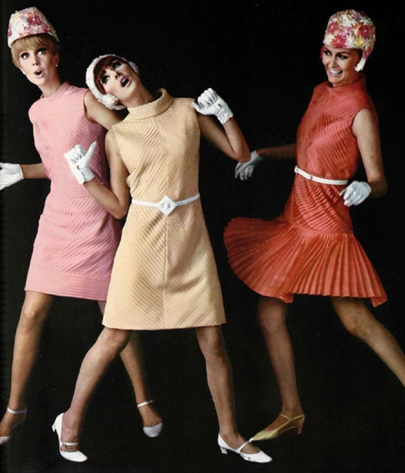 While fashion of the fifties depicted sweeping elegant gowns and couture dresses worn by mature wealthy elitist women, the sixties style was a total deviation from the past. Fashion was aimed at youthful trendy women with tastes and preferences for simple geometric shapes, shorter lengths, and looser fits, clothing typical of the British pop scene. Seamstresses and tailors were beginning to lose business to the mass production of apparel manufacturers. It was a new era of fashion-on-the-go and as style began to change, using elegance as a symbol of prestige and elitism was no longer ‘fashionable’. Things were still looking bright economic wise though, and the good times that emerged in the 1950’s continued well into the 1960’s. Austerity and rationing became something of the ‘distant’ past, and many people including women became beneficiaries of the pleasant economic boom. Suddenly, fashion was becoming commercialised. It became embraced not only by the middle class women, but by the lower class to a certain extent, especially in the Europe and the United States. 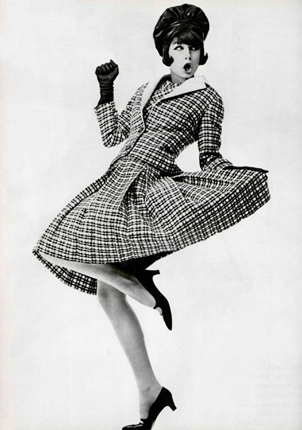 If fashion and style of the fifties inspired individual style signatures, it blew up into enormous proportions in the sixties. Experience has taught many of us born in the forties (baby boomers) that fashion and style is cyclic. It has always been a situation where “the old becomes the new”, always, albeit with a twist. So, to be a part of the vintage inspired fashion crowd, it’s good to know how to put together an ensemble that interprets your favourite era, replicating it in the most pleasing and fashion-forward way. This is quite easy with styles of the 60’s. It’s fifty plus years after, but you can still reproduce the following looks today, have your own signature, and whip up a buzz in the fashion scene.